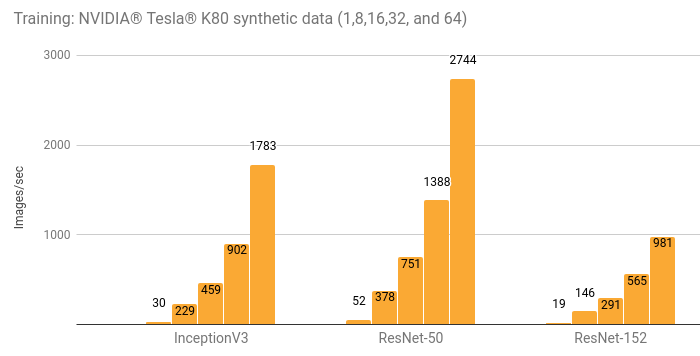 A selection of image classification models were tested across multiple platforms to create a point of reference for the TensorFlow community. The Methodology section details how the tests were executed and has links to the scripts used. InceptionV3 (arXiv:1512.00567), ResNet-50 (arXiv:1512.03385), ResNet-152 (arXiv:1512.03385), VGG16 (arXiv:1409.1556), and AlexNet were tested using the ImageNet data set. 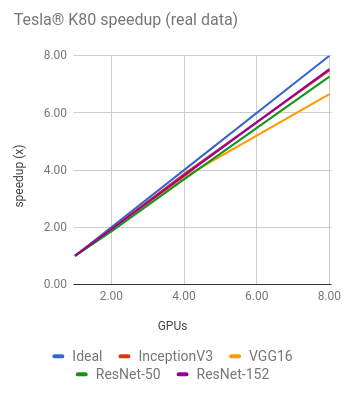 Tests were run on Google Compute Engine, Amazon Elastic Compute Cloud (Amazon EC2), and an NVIDIA® DGX-1™. 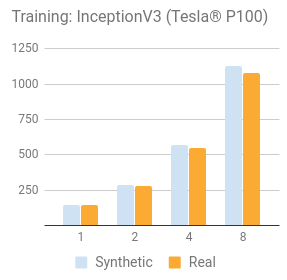 Most of the tests were run with both synthetic and real data. 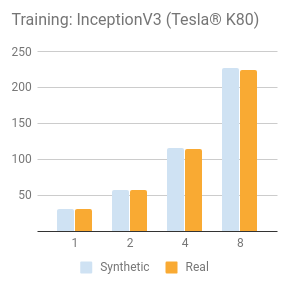 Testing with synthetic data was done by using a tf.Variable set to the same shape as the data expected by each model for ImageNet. We believe it is important to include real data measurements when benchmarking a platform. This load tests both the underlying hardware and the framework at preparing data for actual training. We start with synthetic data to remove disk I/O as a variable and to set a baseline. 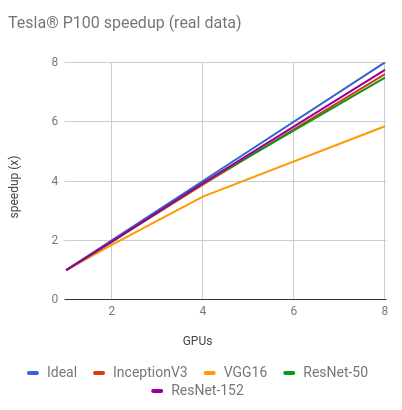 Real data is then used to verify that the TensorFlow input pipeline and the underlying disk I/O are saturating the compute units. Details and additional results are in the Details for NVIDIA® DGX-1™ (NVIDIA® Tesla® P100) section. 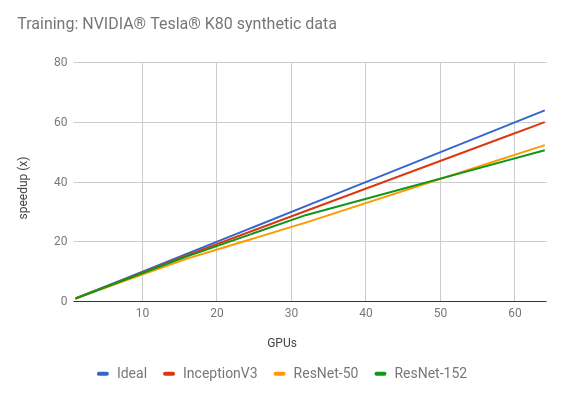 Details and additional results are in the Details for Google Compute Engine (NVIDIA® Tesla® K80) and Details for Amazon EC2 (NVIDIA® Tesla® K80) sections. 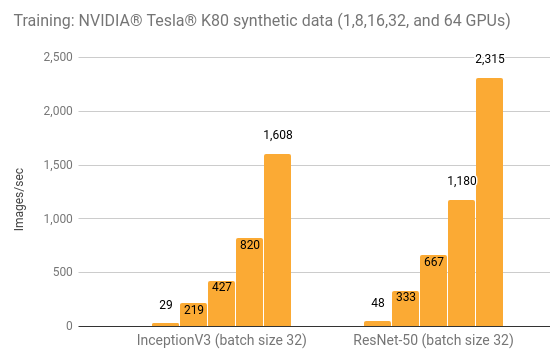 Details and additional results are in the Details for Amazon EC2 Distributed (NVIDIA® Tesla® K80) section. Batch size and optimizer used for each model are listed in the table below. 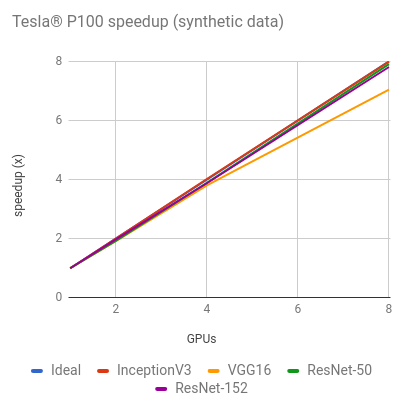 In addition to the batch sizes listed in the table, InceptionV3, ResNet-50, ResNet-152, and VGG16 were tested with a batch size of 32. Those results are in the other results section. Configuration used for each model. 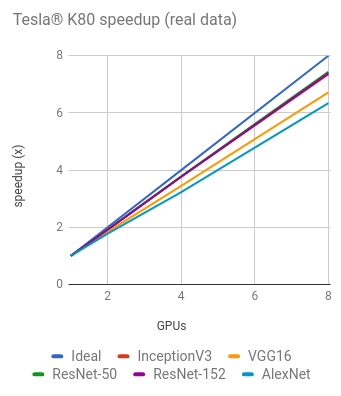 Training AlexNet with real data on 8 GPUs was excluded from the graph and table above due to it maxing out the input pipeline. The results below are all with a batch size of 32. Batch size and optimizer used for each model are listed in the table below. 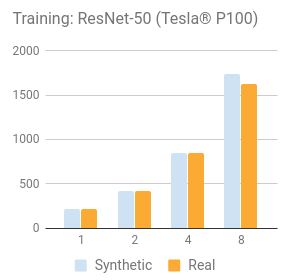 In addition to the batch sizes listed in the table, InceptionV3 and ResNet-50 were tested with a batch size of 32. Those results are in the other results section. The configuration used for each model was variable_update equal to parameter_server and local_parameter_device equal to cpu. Training AlexNet with real data on 8 GPUs was excluded from the graph and table above due to our EFS setup not providing enough throughput. The batch size and optimizer used for the tests are listed in the table. In addition to the batch sizes listed in the table, InceptionV3 and ResNet-50 were tested with a batch size of 32. Those results are in the other results section. This script was run on the various platforms to generate the above results. In order to create results that are as repeatable as possible, each test was run 5 times and then the times were averaged together. 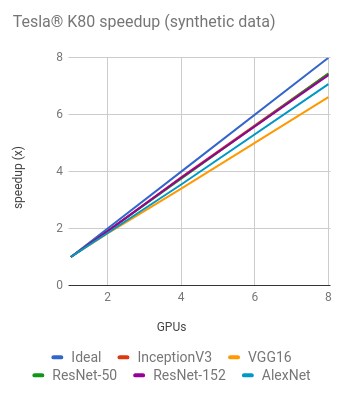 GPUs are run in their default state on the given platform. For NVIDIA® Tesla® K80 this means leaving on GPU Boost. For each test, 10 warmup steps are done and then the next 100 steps are averaged.